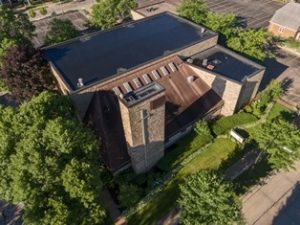 Trinity Lutheran Church is not a place, we are a family. We share each other’s joys and sorrows. We celebrate our triumphs and learn from our mistakes. We care for each other and do our part to make the world a better place. There are no strangers here. We are all brothers and sisters in Christ. Welcome Home! To bring God’s love to the world in worship, witness and service. We are a Christ and Scripture centered congregation. We are a mission centered congregation constantly evaluating its vision to accomplish its mission. We are a congregation whose members sense they belong to the body of Christ and, in turn, want to provide for the needs of others. We are called together to be the Church. To be a people who share the Good News of Jesus Christ. 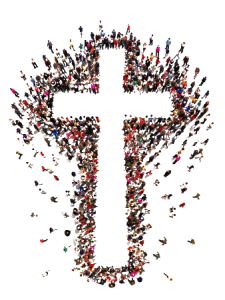 To mark people with the cross of Christ through baptism. To worship our Living Lord both individually and as we gather. To grow in our relationship with Our Lord through regular Bible study, service, personal devotions and prayer. To serve God through care for the sick, the lonely, the poor, the institutionalized and the searching. To share our wealth as good stewards of all that God has given to our care. To look beyond ourselves to the needs of others, reaching out in love. Labor Day through Memorial Day – Sunday Services at 8:15 a.m. and 10:45 a.m.
Summer Schedule – Sunday at 9:00 a.m. and Monday at 6:30 p.m.
Trinity Lutheran Church is located in downtown Stevens Point, on the corner of Clark and Rogers Streets, four blocks east of the Clark Street Wisconsin River Bridge. Enter the parking lot either from Clark Street, Rogers Street, or Ellis Street. Click here to get to know the Pastor at Trinity Lutheran Church. The Rev. Dr. Clayton J. Schmit, who likes to be called either Clay or Pastor Clay, is originally from Tomahawk, Wisconsin. 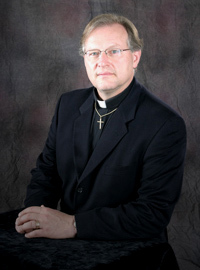 He moved recently to Stevens Point from Columbia, South Carolina where he served as the Provost (President) of Lutheran Theological Southern Seminary of the ELCA. Prior to that, Pastor Clay taught at Fuller Theological Seminary in Pasadena, California and at Duke Divinity School in Durham, North Carolina. His first two pastoral calls were at Olivet Lutheran Church in Fargo, North Dakota and Elim Lutheran Church in Petaluma, California. Pastor Clay’s degrees are from the University of Wisconsin-Eau Claire (Vocal Music Education), Luther Seminary in St. Paul (Master of Divinity), and the Graduate Theological Union in Berkeley, California (PhD in Worship and Preaching). Pastor Clay is married to a Los Angeles native, Carol L. Vallely. She is an attorney and an entrepreneur, having recently begun a business importing Spanish handbags. Carol and Clay have two grown children. Kyrie is a counselor in Asheville, North Carolina and Jacob works for an architectural construction firm in Phoenix, Arizona. As a scholar and teacher, Pastor Clay has authored a number of books on Worship, Preaching, and the Arts. As a musician, he has directed several church and secular choirs. His church choir in California made three European tours and his secular choirs performed numerous times on board naval vessels stationed in San Francisco Bay and at Giants baseball games. (He loved his time in the Bay area, but remains a true Packer fan!) Pastor Clay is also a vocalist, a guitar player, and a hymn and song writer. Pastor Clay and Carol enjoy fly fishing, skiing, hiking, and canoeing/kayaking. They have a beloved St. Bernard named Lily whom you may occasionally see around church, especially in Pastor Clay’s office. Pastor Clay also enjoys woodworking and picking dog hair off his sweaters. He and Carol are eager to get to know the Trinity family and the Steven Point community. Click here to get to know the staff at Trinity Lutheran Church. Music and other part-time staff can be reached by using the Contact Us page. Trinity is in the Tomorrow River Conference of the East Central Synod of Wisconsin, ELCA.